The fourth man to play James Bond in the official series, Timothy Dalton, celebrates his 73rd birthday on 21st March 2019. He is known for his serious portrayal of 007 and his mindful adherence to the characterisation of Bond's creator, Ian Fleming. Timothy Peter Dalton was born to an American mother and English father, who was both a soldier and a successful advertising agent. The eldest of five in the family, Dalton grew up in Colwyn Bay, Wales, where they resided from the time of his birth. After leaving high school, Dalton won a place in the prestigious Royal Academy of Dramatic Arts in London. He never completed his course at RADA, and freely admitted that he found teaching was no substitute for intuition or experience when it came to acting. In 1968, Dalton made his breakthrough in to cinema in the Academy Award winning drama "The Lion In Winter". After this auspicious start in film, Dalton returned to local UK stage productions before winning a role in the BBC's "The Three Princes" which aired on UK television in the winter of 1968. It was in '68 that he was first approached by Bond producers, Albert R. Broccoli and Harry Saltzman to star in their latest Bond picture - "On Her Majesty's Secret Service". Dalton turned down the role out of respect for the character, feeling he was too young to accurately play the famous British spy. However, he left a distinct impression with Broccoli, who vowed he would not take no for an answer next time. 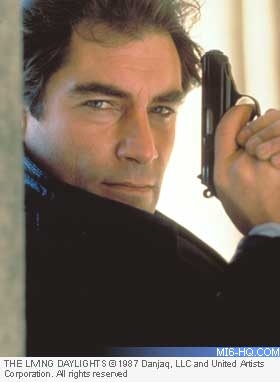 Read MI6's In-Depth Timothy Dalton Biography.